Joni spent 25 years focusing on fitness, including distance running, spinning, and lifting weights. She came to Yoga as a student in 2009 to stretch some sore muscles, but found that Yoga encompasses so much more! In addition to lengthening, strengthening, balancing, and opening the muscles and joints, Yoga allows students to quiet their minds, learn to be present, and tap into the peace that lies deep within. Joni wanted to guide others into discovering both the physical and emotional benefits of Yoga. So with that goal in mind, she became a Registered Yoga Teacher (200 hours) with additional certifications in Restorative Yoga and Reiki Level 2. 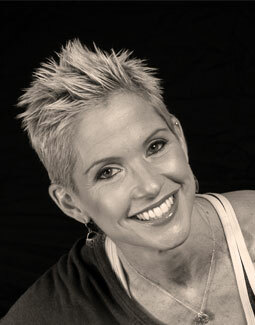 After practicing at the Sumits Kansas City studio, Joni pursued certification as a Sumits instructor. She appreciated the friendly, supportive environment of the Sumits Kansas City studio from the moment she walked in the door. There was a sense of community during the practice, too, with everyone supporting one another, from the beginner to the advanced student. Offering something for everyone, the Sumits Sequence class provides an opportunity to observe progress and cultivate improved focus, while the Sumits Flow class offers a change of pace, for those who like to shake up their yoga routine. Being an instructor at Sumits Kansas City means meeting students where they are and encouraging their growth– on whichever path they choose that day. Joni’s Yoga class will both nurture and challenge your body as you experience the beautiful shapes your body can create in a safe environment of self-acceptance. Modifications are always encouraged so all students can feel rewarded in the practice. There is no “goal” in Yoga- just listen to your body, face challenges without fear, and believe you can do your best! Passionate about deepening her students’ experience of Yoga, Joni continuously looks for opportunities to attend Yoga training, workshops, conferences, and retreats. In December, 2015 she returned from a life-changing Yoga retreat in India. The joyful energy that Yoga has created in her life, Joni will share with you during every class. Joni is married with three kids, two cats, two rats, and four fish. She continues to be a fitness enthusiast so she can keep up with all the little creatures- human and otherwise- who occupy her home :-). Joni feels privileged to be a part of this vibrant studio. With gratitude she welcomes you to her classes.